More NYC Municipal Archives tax photos today kids! Unlike the post here last week featuring buildings that no longer exist, everything I am showing you today is still standing, although Topps is no longer in any of them except the last. I've posted more current pictures of these places before but since the Municipal Archives material is only readily available now I though I'd time trip a bit, so forgive any repetition. 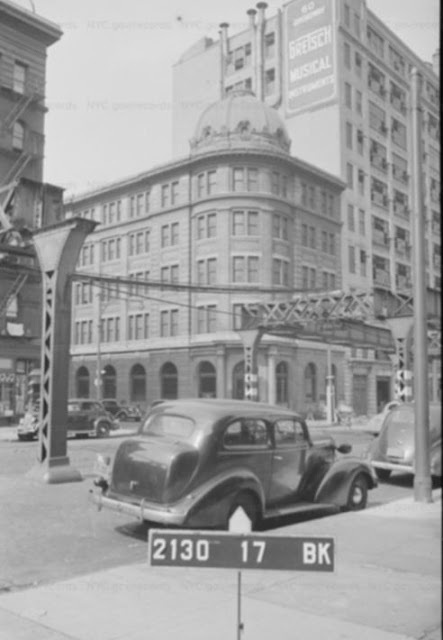 Topps started life by renting a floor in the Gretsch Building at 60 Broadway in Brooklyn. 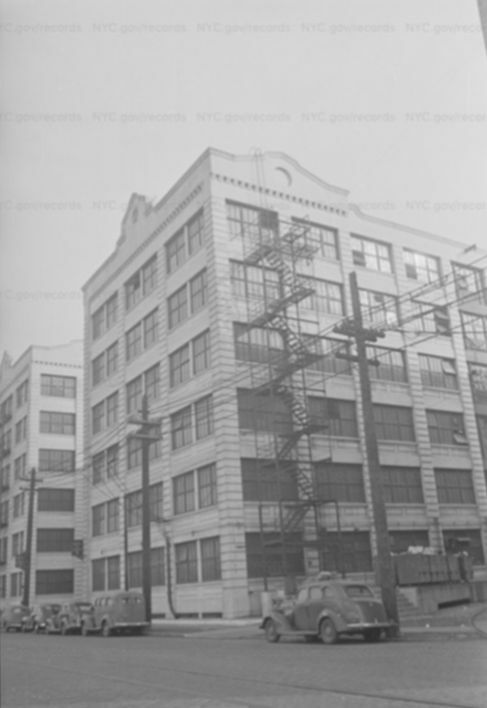 Mere blocks from the Williamsburg Bridge, this ten story building was where Gretsch Instruments manufactured some of their products. The Shorin and Gretsch families seem to have known each other and in fact Morris Shorin bought a house on tony President Street from Fred Gretsch around 1920. The "four Shorin boys" (Abram, Ira, Phil and Joseph) founded and ran Topps from the get go. Morris either provided funding and/or was a silent partner until he died in 1947, having likely retired from the leaf tobacco business in 1938. They set up here right around the time this photo was taken, with a bunch of old machinery installed to make their first product, Topps Gum. Dig that infrastructure either going up or coming down (I suspect the latter). The other feature I see a lot in old pictures of Brooklyn and Manhattan are domes, like the one atop the building next to Gretsch. 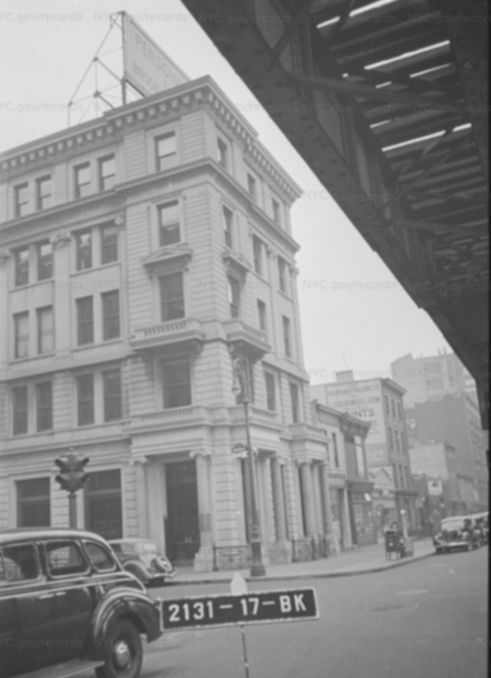 This is not the main view of 60 Broadway; it's mysteriously missing from the tax photos online. It's the building with the truck in front of it. There's a small, low-slung garage/loading bay attached to it, which you can see on the right just past the truck as your eye looks toward the vanishing point. It's funny how the trucks look pretty modern while you expect Murder Incorporated to jump out of the sedan passing by the building with tommy guns blazing. By the middle of 1946 though, Topps had decamped to Bush Terminal, where they maintained production for the next twenty years. Don't worry, they were still using all of their older spaces for storage during this period as well! Nothing got cleaned out of them until the Duryea, PA move in 1966. This is the 237 37th St. address on the right, with 254 36th St., where they expanded operations in the mid 50's to the left. 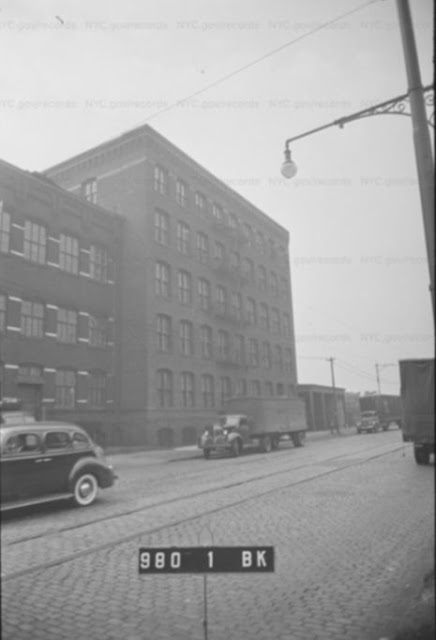 I can't get the address locator to show the right building for 254 36th St., it keeps showing Building No. 4 (using Bush Terminal building numbering scheme) when I believe it should be No. 2. Their apace at 237 37th St. was in Building No. 1 by the way. I used to occasionally visit One Whitehall as part of my job in the 1980's but that was before Topps moved in. Word is they still have a trove of test issues up there, many unseen outside of a few select folks, just waiting for the right offer. I would not put anything past this company, so who knows?